Are you looking for an Ice Box? … If you are looking for a cooler that will allow you to haul ice around with you, and keep that ice frozen as long as possible, you might want to check out one of the other popular brands of luggable ice box style coolers. Are you looking for a Cooler? … If what you really want is to enjoy a day out with family & friends, keeping your food, drinks, and other life necessities fresh and refreshing all day, with no extra weight, extra cost, sloppy mess, or extra clean-up; then you probably want a Cape Woolamai or Didgeridoonas Ice-Free Cooler. Crafted from ruggedly elegant, water repellant Australian Oilskin (waxed cotton) canvas, and insulated with pure Australian wool, these coolers & koozies are simply Mother Nature at her best. You can use your Cape Woolamai & Didgeridoonas coolers & koozies to keep cold items cold, or hot items hot, for hours, without any artificial help. Add a reusable freezer block to your cooler bag to keep the contents refrigerator cold for up to 24 hours (or more). And did we mention that your Cape Woolamai & Didgeridoonas ice-free coolers deliver the same carrying capacity of the popular, hernia inducing, ice box coolers at a fraction of the price? We cannot get enough of your photos & stories about where your cooler bags have taken you, and how they help you enjoy life’s adventures. Please Share your pictures and stories with us and the Cape Woolamai community of Facebook and Instragram by tagging them with: @CapeWoolamai and #TakeAWalkabout. Your Cape Woolamai & Didgeridoonas ice-free coolers and koozies are simply Mother Nature at her best. Crafted from rugged, water repellant Australian Oilskin (waxed cotton) canvas, and insulated with pure Australian wool, the newest technology involved in making these unparalleled coolers is roughly 700 years old. “Oilskin” is a rugged, tightly woven, duct canvas, treated with a mixture of natural oils and waxes to make the fabric lightweight, water repellent and virtually indestructible. Pure Australian wool is still one of the best insulators on the planet. When blended with a little Aussie ingenuity, the ingredients combine to create the only coolers you will own that don’t require ice. Your Cape Woolamai & Didgeridoonas ice-free coolers are crafted from rugged Australian Oilskin (waxed cotton) canvas, inside and out, and insulated with pure Australian wool. The waxed cotton canvas is water repellant, but breathable. The wool insulation is water repellant, but vapor absorbent. The cold (or hot) vapor put off by the contents of your cooler bag passes through the inner layer of canvas, and is absorbed into the wool insulation, setting the temperature of your bag. It is by adopting the temperature of the contents that your cooler bag has the amazing staying power these coolers deliver. You can expect your Cape Woolamai & Didgeridoonas ice-free coolers to keep hot items hot for up to 4-5 hours before you may want to reheat them, and cold items cold for up to 6-8 hours without any artificial help. Add one or more reusable freezer blocks, and your cooler bag will act like a portable refrigerator for up to 24 hours (or more). Obviously, environment will have some impact on how cold your bag stays on any given day. But you can count on your Cape Woolamai & Didgeridoonas coolers to consistently out perform a comparably packed luggable ice box cooler … our customers tell us so. We are asked all the time, “Do you have to keep it in the freezer?” … “Do you have to pre-chill or pre-heat the bag?” … NO & NO. 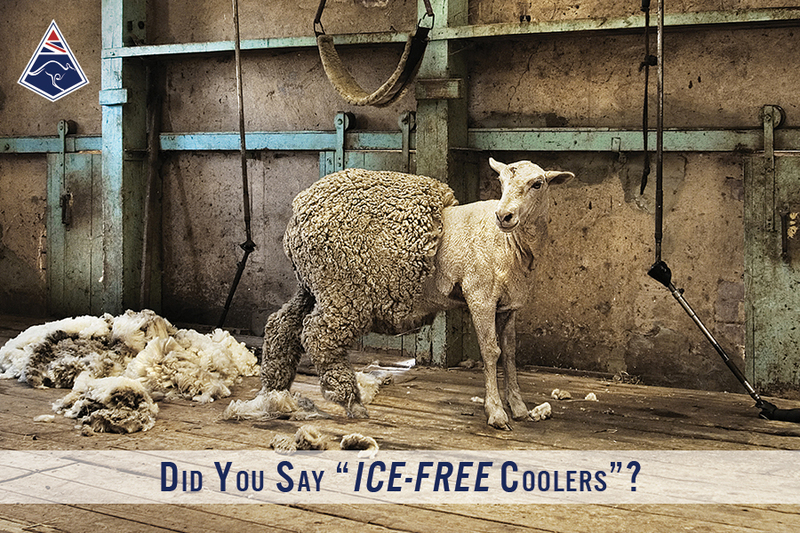 Thanks to the magic of the pure Australian wool insulation, using your Cape Woolamai & Didgeridoonas ice-free coolers and koozies is as simple as Grab – Fill – Go. Your cooler or koozie will adopt the temperature of whatever you put in the bag, and hold temperature for up to 6-8 hours (4-5 hours on the hot side) without any artificial help. Unlike so many of the luggable ice boxes on the market today which specify that you need to pre-chill the coolers to get the best results, your Cape Woolamai & Didgeridoonas coolers are ready to go the moment you take it off the shelf. If you want to keep the contents of your cooler refrigerator cold all day, simply add one or more reusable freezer blocks to the contents to maintain the cold all day. The coldest item(s) in the bag will begin to set the temperature. “Will I damage by cooler or koozie if I keep it in the freezer?” Our best answer to that question is: Apparently Not. We have had multiple customers report back to us that they keep their koozies or a cooler bag they use as a lunchbox in the freezer or fridge, and have done so for years, with no ill affect. We do not promote this capability as a standard feature, so you can decide for yourself. The best choice will always be to add a reusable freezer block to extend your cold. Freezer blocks freeze at a lower temperature, and stay colder longer than frozen water (ice). This allows you to keep the contents of your cooler bag colder, longer, with less bulk and mess. If you cannot, or do not wish to use a freezer block, double-bagging some ice cubes in quart size, zip-top freezer bags are a good second choice. The quart size bags reduce the amount of surface area exposed to air, which helps slow the melting. Double-bagging also helps to further slow the melting and helps to contain the resulting water. Some customers will freeze a water bottle to use in place of a freezer block. This works also. Two cautionary notes: 1) Do not count on being able to drink that bottle of water until very late in the day, and 2) a frozen water bottle may sweat more than double-bagged ice cubes. We do have some customers who report simply just pouring loose ice into their cooler bags. Although the oilskin inner lining does help to keep the bag from leaking, as the ice melts, you can count on having a wet mess, just like you will have with any other ice-box cooler. NO, you will not ruin your Cape Woolamai or Didgeridoonas cooler bag if you put loose ice directly into the bag … but you may ruin your lunch. Oilcloth was originally used for sailcloth and rain slickers. It can handle water. The real question is why would you want the inevitable mess, unless you have no other choice? Thanks to the breathability of the waxed cotton canvas and wool, your Cape Woolamai & Didgeridoonas ice-free cooler bags will accumulate very little condensation (unless you use ice to help extend the cold). The best way to keep your cooler bags dry and fresh is to reach inside the bag after you empty the contents, take hold of the bottom of the inner lining, and flip the lining inside out. With the lining flipped inside out, you can easily wipe down any excess moisture or debris. Leave the bag to air out and dry (if damp). It will typically dry in a matter of hours (or leave it overnight). Then push the liner back in, fill up your bag again, and go out and enjoy yourself. Reach in and grab the bottom of the inner lining. Pull the lining up to flip it inside out. Note: You cannot flip the inside lining out on the Cape Woolamai “Beach Collection” of koozies (Bondi, Cairns & Manly) due to the drain hole in the bottom. Wipe off any loose dirt or debris with a damp rag. For non-sticky spills, they may clean up with a simple wipe down with a damp rag. For more serious spills, spray the soiled area with an organic, or other non-greasing cutting kitchen spray, and wipe down with a sponge or rag. For a real sticky mess, you may have to repeat. Leave the lining flipped inside out and allow to air dry (overnight should be plenty). You can test the water repellency of the lining by pouring some water on the lining. If the water rolls off, your water repellency is fine. If the fabric looks like it is trying to wick up the moisture, this would be a good time to give it a light reproofing (see: Cooler & Koozie Maintenance). Your Cape Woolamai & Didgeridoonas koozies will help keep cold drinks cold, and hot drinks hot, from the first sip to the last. The magic is in the insulating capacity of the pure Australian wool lining. Your koozie simply adopts the temperature of whatever you put in it and will hold temperature for up to 6 hours. Obviously, environment will have some effect on the staying power of your koozie; just like it will influence your thirst for what your koozie holds. Bottom line, your Cape Woolamai & Didgeridoonas koozies will keep your drinks fresh & refreshing from the first sip to the last. The temperature of your bag, and the duration the bag will hold temperature, will be impacted greatly by the starting temperature of the contents. If the contents are cold when they go into the bag, your bag will get colder faster, and will stay colder longer. If the contents are hot when they go in, your bag will get hotter faster, and stay hot longer. If the contents are room temperature when they go in, you will want to add an appropriate volume of freezer block(s) in order to chill both the bag and the contents and keep them cold all day. Think of your cooler bag as a portable refrigerator. When you add freezer block(s), the temperature of the block(s) will begin to set the temperature of the bag. Adding room temperature items to your bag is just like putting these items into your refrigerator at home. Depending upon the item, it will take some amount of time for the items to become refrigerator cold. From there, if you have a sufficient volume of freezer blocks, they will stay refrigerator cold for up to 24 hours (or more). Whatever portion of the bag you wish to keep cold, we'll typically suggest adding reusable frozen blocks to account for at least 10% of that space (unlike the 50%+ capacity required in typical ice-based coolers). You may adjust from this baseline based upon your environment and how you intend to use your bag on any given day. If you are loading the bag fairly full, or possibly packing items which were not pre-chilled but which you wish to chill and keep cold, we suggest that you might put multiple smaller blocks in the bag, rather than one big freezer block. This allows you to better distribute the cold faster and keep the contents cold longer. We also recognize that glass and metal radiate heat and cold more efficiently than plastic. We will typically pack glass and metal containers closer to the freezer blocks, knowing that they will radiate the cold to plastic items with greater efficiency. Our customers find so many unique ways to pack their cooler bags to best fit their lives that we cannot even begin to document all the stories we have heard. But that does not mean we are tired of hearing your stories. Please let us know how you use your Cape Woolamai & Didgeridoonas ice-free cooler bags and koozies. We love to learn from your experiences. When we are packing a cooler bag with the objective of keeping the contents cold all day, we will often start by laying a floor of freezer block(s) across the bottom of the bag. We will then log stack the drinks we wish to carry on top of the block(s). We’ll pack food items on top of the drinks. Any medications which might need to be refrigerated go in next. On top we load the miscellaneous items such as sunscreen, bug spray, cosmetics, sunglasses, wallets, or whatever else we wish to carry. 1 - 16oz freezer block can do a great job chilling a bag. 2 or 3 - 8oz freezer blocks may do a better job because you can distribute the cold more efficiently around the bag. 4 - 4oz freezer blocks can do a great job as well. Caution: The smaller the freezer block, the faster it thaws, and the shorter the effective chilling time. 4 – 4oz freezer blocks may not work as well for you as 1 – 16oz freezer block, or 3 – 8oz freezer blocks for a summer day at the beach. But these coolers sure make a great Beach Bag! NO. We typically use generic brand freezer blocks which are readily found at stores such as Target, Walmart, and our local grocery stores. We have had some customers report that they have used freezer blocks which came with medical products they receive with great success. We have many customers who simply opt to use a frozen water bottle. Thanks to the magic of the pure Australian wool insulation, you do not need to spend extra money, buying some specialty product. Save that money for the food & drinks you wish to enjoy. Caller: There’s a hole in the top of my bag! Customer Care: Where at the top of your bag is the hole? Caller: It’s right by the Velcro. Customer Care: Is it next to the Velcro, or below the Velcro along the seam? Caller: It’s next to the Velcro. Customer Care: Is this an opening in the top to the outside of the Velcro seal? Thank You. Good News, everything is okay. That is the way the bag is designed. Your bag is designed so that when you open the bag, the top comes fully open to allow you full access to the usable space inside the bag. Then, when you close the bag, the plan is to fold the corners in so that there is a small opening to vent some of the vapor. This helps eliminate condensation from accumulating in your cooler. Your cooler is designed to be strong enough to handle twice the maximum capacity you could put into the bag. These coolers are built to last. As a result, when they are new the corner seams and straps can be a little stiff, and they may tend to want to pop out to the side. You want to "train" your corners to stay tucked in under the Velcro closure. Don’t worry, this does not take long. Do Not wash with a harsh, grease cutting detergent or hot water, as this can remove the oils & waxes which keep your cooler or koozie waterproof. When your cooler or koozie gets dirty, knock off the loose dirt with your hand or a soft brush, then sponge it off with cold water. For tough stains, use Oilcloth Wash or a gentle, non-grease cutting cleaner to spot wash the stained or sticky area, and sponge off with cold water. For those times when you want to give your “rode hard” coolers & koozies a total refresh, we recommend using our Wool/Oilskin Wash to clean your cooler, and then replenish the protective oils & waxes with our Oilskin Reproofer. Remember: The Oilskin inner linings of your coolers & koozies can be turned inside out for easier cleaning (except for the koozies with the drain hole in the bottom). This must be done very infrequently (varies based upon use). What to Look For: The indicator that it could be time to reproof your cooler bag is the day when your bag gets wet and it appears that the canvas is wicking in the water instead of shedding the water. The time span between reproofing’s will vary based upon how you use and care for your bag. But we are talking in terms of years, not months. If your bag is dirty from going out and having fun in the sun, sand, dirt & grass, or from tossing around in the trunk of the car, you may wish to use an Oilskin Wash to clean your cooler before reproofing. Or, you may simply opt to wipe it down with a damp rag to get off any loose dust and debris. Follow the directions on the liquid spray bottle or the wax tin for applying the reproofer. No need to over-apply. A simple misting of the liquid, or a light layer of the wax will go a long way. Leave your bag out in a cool dry place (preferably out of direct sunlight) over night. Load it up, and put it back to work. Always store your oilskin product in a dry well-ventilated area. Particularly when your oilskin product is new, it is possible for the oil & wax proofing to transfer to other fabrics. This is more common when items are placed in contact for a prolonged period at high temperatures or pressure. Note: You will notice that many Cape Woolamai & Didgeridoonas products which are designed to be worn in direct contact with other fabrics (ie: Backpacks, Purses, Messenger Bags) have a Teflon-coated canvas backing, to prevent any possible wax transfer. Many people like to personalize their ice-free coolers by adding pins or patches. It is strongly recommended that you only add pins or patches to the non-insulated pockets or flaps. Piercing the insulated portion of the bag can make it possible for moisture to get to the wool lining. Although this is not a critical problem, it could shorten the usable life of your cooler. Your Cape Woolamai & Didgeridoonas coolers and travel accessories are Guaranteed for Life® against defect in material or manufacture. YES, guaranteed for life is a double entendre. As our customers learn very quickly, these amazing Australian products add a touch of luxury to your life & leisure. They simply work like crazy, take a beating, and are guaranteed for life. You can wear them out, and you are going to have a great time doing so. Contact our Customer Care Team about any concern you have email or telephone: Contact@CapeWool.com or 540.338.8189. If necessary, our Team will give you directions on how to return a defective product for repair or replacement. Upon assessing the product, we will either repair or replace the product at no cost to you.